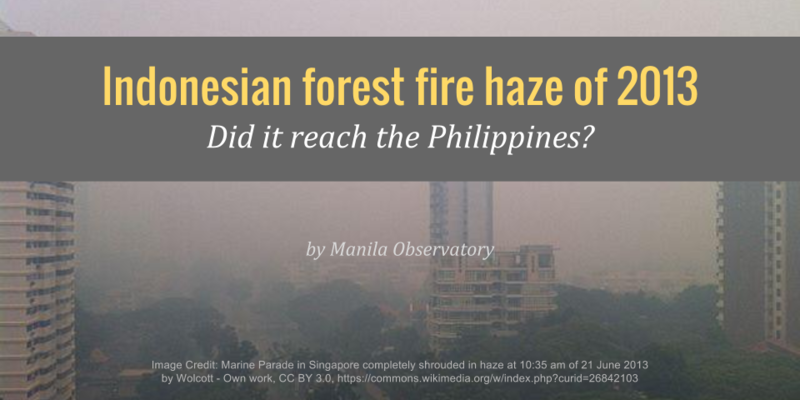 Did the Indonesian forest fire haze of 2013 reach the Philippines? From 14-23 June 2013, Singapore, parts of Malaysia and Indonesia were blanketed in a dangerous haze as fires burned in the neighboring forests of Indonesia. Images from Singapore depicted citizens wearing protective masks and skyscrapers obscured by the haze. Smoke from the fires in Indonesia were directed to Singapore, Malaysia, Indonesia and other Southeast Asian countries because of wind. Because of the poor air quality levels, those outdoors wore face masks for almost a week in order to protect themselves from the haze, reported to have an acrid smell of burnt wood. Figure 1. 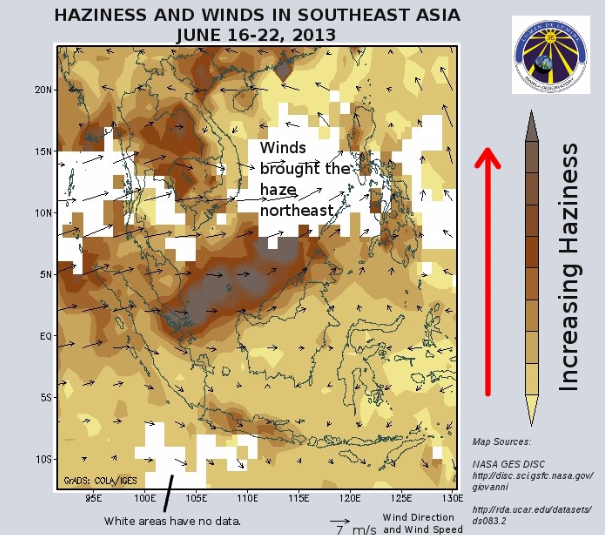 Haziness was highest in Singapore and Malaysia for the week of June 16-22, 2013. This haze was transported by winds northeast towards the ocean, Malaysia, Brunei, Indonesia and the Philippines. This is not the first time that the forest fire burnings have affected the Asian region, traces of which have even reached the Philippines. Forest fire burnings in Indonesia and elsewhere in the region are a regular event. But the conditions this time were worse than the record haze event from forest fires in 1997. Fires produce pollutant gases and very tiny particles that are able to stay in the air for days to even weeks and can travel thousands of kilometers. Because the particles produced by forest fires are so small, they can also bury deep in the lungs, causing or aggravating respiratory ailments and heart diseases. 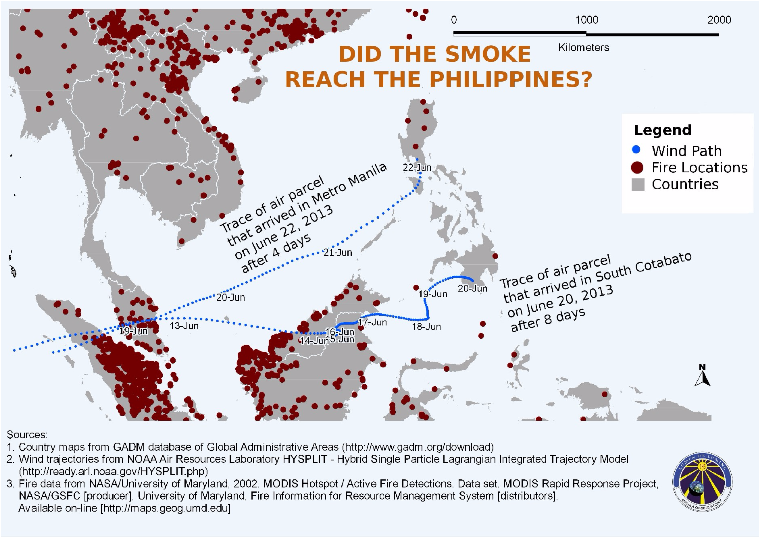 Did the smoke from the forest fires reach the Philippines? The Manila Observatory (MO) is a non-profit, private Jesuit scientific organization that conducts research and monitoring on air quality. In partnership with the National Aeronautics and Space Administration (NASA) and Notre Dame of Marbel University (NDMU), MO maintains an Aerosol Robotic Network (AERONET) monitoring station in South Cotabato to study and monitor air events. Haziness measurements from the monitoring station in NDMU in South Cotabato peaked to more than 5 times their average value for the month on the mornings of June 18 and 20, at the same week of the peak forest fire burnings (Figure 2). This resulted in conditions that may have obscured the view of the sky. Winds from the west brought the smoke across the ocean to Central Mindanao. Figure 2. Peaks in aerosol optical thickness data, which is a measure of haziness, on June 18 and June 20 from the sunphotometer (NASA Aeronet) in the Notre Dame of Marbel University in South Cotabato, occurred during the peak of the forest fires in Indonesia. 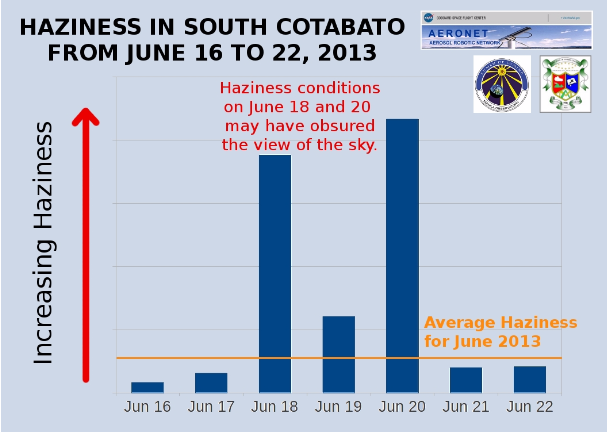 Haziness levels on June 18 and 20 may have caused the view of the sky to be obscured in South Cotabato. Did the smoke reach Metro Manila and should we be worried about pollution from neighboring countries? Winds suggest that the smoke may have reached Metro Manila (Figure 3). However, it is important to note that Metro Manila air is already highly polluted from various local sources, particularly traffic exhaust from vehicles. It actually does not take pollution from elsewhere to make the air in Metro Manila dangerous. The gases and minute particles that make up air pollution in the Metro can seep through even shut windows and airconditioners, posing a real health threat to all. Figure 3. Air parcels that arrived in South Cotabato on June 20 (8 days from Sumatra, Indonesia, Malaysia and Borneo, Indonesia), when the haziness peak was recorded, and Metro Manila on June 22 (after 4 days from Sumatra, Indonesia) came from the area where the forest fires were detected by NASA. Air pollution is reported to the public in terms of indices that correspond to health effects. Singapore uses the pollution standard index, PSI, which relates the combined levels of selected pollutants with its health implications. From June 17 to 18 the air in Singapore was “unnhealthy” and on June 19 until June 21, when the PSI values peaked at 401 PSI, it was “hazardous” to “very hazardous”: which may be life-threatening to ill and elderly persons (Government of Singapore and BBC). The Philippines established its own National Clean Air Act 15 years ago and just recently set a standard for the fine particulate pollutant, particulate matter (PM) 2.5. PM2.5 levels can also be described in terms of Air Quality Indices (AQI) based on the USEPA. In Metro Manila, from regular measurements made from 2002 by the Manila Observatory, PM2.5 AQI has been “unhealthy to the general public” by major roadways such as EDSA, and “moderate” to “unhealthy for sensitive groups” in Manila Observatory, Quezon City. Each New Year’s, since 2003, PM2.5 AQI have reached “hazardous” levels (Figure 4). Figure 4. 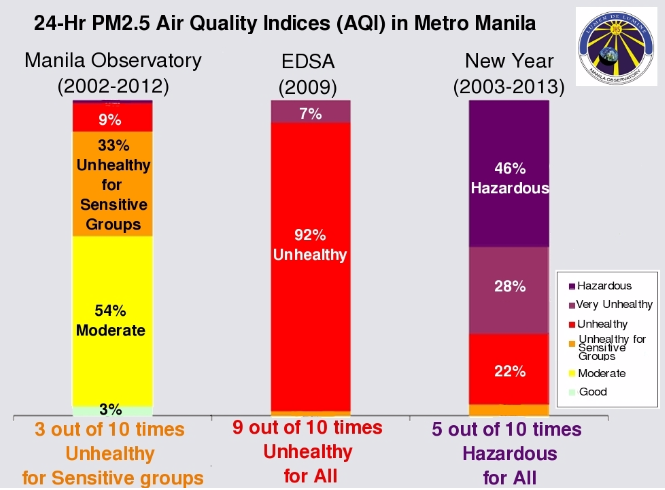 Air quality in terms of particulate matter (PM2.5) indices (USEPA) around Metro Manila is “unhealthy” for the general population along major road ways like EDSA, and ranging from “moderate” to “unhealthy for sensitive groups” in Manila Observatory, Quezon City. New Year air quality in some places around Metro Manila, has been “hazardous” (which is actually a health alert) since 2003. This means that along EDSA everyone may experience health effects, with more serious effects to sensitive groups, and during the New Year’s in some areas in Metro Manila everyone may experience serious health effects. We would like to acknowledge Monica Ortiz for reviewing the article. Analyses and visualizations used in this study were produced with the Giovanni online data system, developed and maintained by the NASA GES DISC. We also acknowledge the MODIS mission scientists and associated NASA personnel for the production of the data used in this research effort, Giovanni of Earth Data, National Centers for Environmental Prediction, National Weather Service, NOAA, U.S. Department of Commerce (2000) (NCEP FNL Operational Model Global Tropospheric Analyses, continuing from July 1999), and the Research Data Archive at the National Center for Atmospheric Research, Computational and Information Systems Laboratory for the dataset.